We arrived by 9.30am and waited for the embassy to open, there is a small window on the left where you need to collect a ‘questionnaire’ form and (possibly) their own application form (you can download the US version here for sample questions) from a grumpy embassy official. In the ‘location of planned visit in Turkmenistan’ we wrote “Farab to Sarakhs”. We did try our luck to get the Northern route via the Darvaza Crater and Ashgabat but were met with the sharp response “you’re in transit, not visiting as a tourist!! !” By this stage we were just glad to be able to cross the country. Make sure you give yourself plenty of time to collect the visa and get to the border when you consider your entry date to Turkmenistan- the 5 days is super strict and you can only travel within the dates you give them. You need to pay $20 Processing Fee at the nearby Alpha Bank (location N 43° 14.954’ E 76° 55.760’) tell them it is for the Turkmenistan Visa fee, they issue you a receipt which you need to show at the embassy with your application. We submitted all our documents etc and were told to come back the next day at 10am to receive our reference number. We took our chances with the quickest time mentioned in Almaty and went to see if our visa had been approved at the Turkmenistan embassy in Tashkent 7 days after we had submitted our application in Almaty. We were called through the big entrance gate at 9.10am, had to leave cameras, phones etc at gate, we were then ushered up steps to a big fancy office. The man at the consulate was very friendly and spoke good English, he took our reference numbers and checked on his computer system (while we held our breath), then said our visas had been approved and were ready for collection. We filled out another application form, gave a passport photo, paid the $55 visa fee each and left our passports with him and were told to come back at 4pm. We returned to the embassy at 4pm, there was a less-organised queuing system of pointing and agreeing ‘you were before me’. Waited 45 minutes for our turn then back through the gates to the fancy office where we collected the visa straight away. ​We arrived at the Farap/Alat border crossing at 7.45am (the border opens at 8am) and were first in the queue, overtaking a huge line of trucks with all the Iranian truckers sat in the road having breakfast. Officers opened the gate, we parked outside the customs building on the left and waited in the waiting room for them to finish having breakfast. We filled out customs forms (Cyrillic), important that the amount of cash you are taking out of Uzbekistan is not more than when you entered. A customs officer went through the photos on both our phones and even took the USB key I keep in my bag and went through all the files on that as well. My bag was scanned and he waved a metal detector over us which bleeped when it went over the metal wire in my bra to his embarrassment and our (stifled) amusement. We had to wait until 9am for the passport control booth to open but it was still only us and a few truck drivers. The officer had a brief look through our hotel registrations, then gave us an exit stamp on our visa. 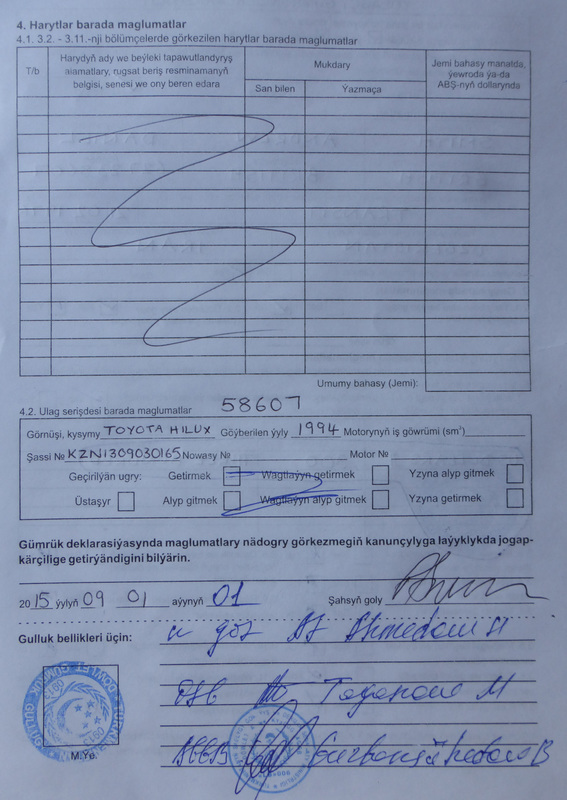 There was a fairly detailed car check leaving Uzbekistan by customs, this time they focused on the medical box, questioning the DEET mosquito repellent bottles and indigestion tablets but were satisfied with a mosquito bite and stomach-clutching mime. We paid nothing to exit Uzbekistan, the guards were friendly but still searched us thoroughly even though we were exiting. Arrived to the Turkmenistan border entrance at 9.30am, drove past a huge queue of trucks to the first barrier. Passport and car registration document checked and details entered into a ledger. We parked at customs and went into the office building on the left, it was already busy with Iranian truck drivers but they all waved us to the front of the queue. Our passports were checked at the main desk, then we were sent to an adjacent ‘bank’ window here we paid $24 and signed several receipt duplicate books and a ledger. When we took these receipts back to the main desk we were issued with our entry stamp. We filled out personal customs declarations forms which include how much cash you are taking in to the country. We had to find someone who spoke English to get a second form for each of us so we had a copy to hand in when we exit the country (important!). These forms were stamped and signed by 3 separate people!?! The customs officer asked if I had “medicaments?” I mimed ‘only headache’, “narcotics” no, “books religious?” no. ​There is a separate desk for the car customs paperwork- the only English-speaking officer was steaming drunk, we were issued with an A4 carbon-copy triplicate form ‘entry permit’ which has a pre-determined route drawn on it. This paper is also your insurance. Also issued with 2 mystery blue pieces of paper. The info from all these papers was entered in another ledger (for a $1 fee! ), We then took the 2 blue pieces of paper and the A4 entry permit to the ‘bank’ window, paid $94 in total for the car and were issued with 2 receipts. 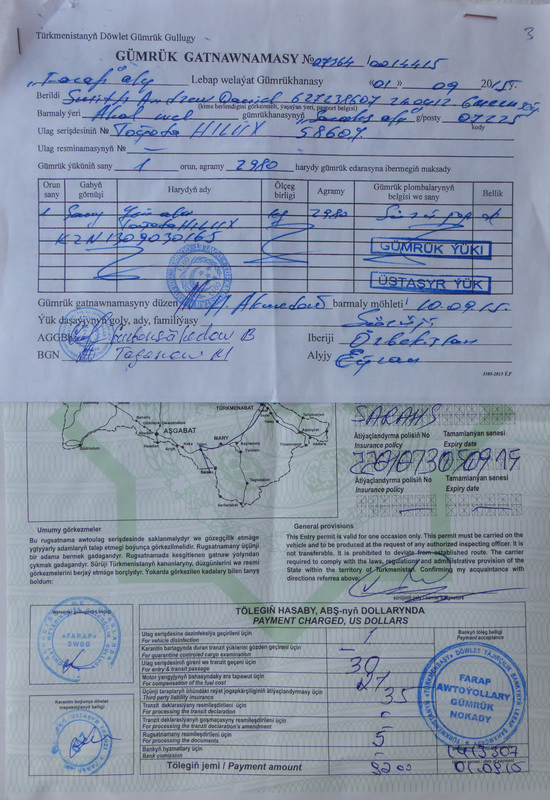 ​We took the car payment receipts and entry permit back to the customs desk, more receipts, signing and stamping, then we were given our entry permit back with the receipt stapled to it and told to hand it in to customs when we exited at Serakhs into Iran. At 10.45 am we joined the queue for the customs bays outside and were fortunately waved to the front. At this point we had 18 pieces of paper, 38 stamps, 25 signatures and had our details entered by hand into 6 separate ledgers. Our car check was fairly thorough, the officer climbed right inside the roof-tent and looked under the mattress. They made us take out and open every box (trying to mime what a suppository was was fun), he partially unscrewed the car floor panel and looked underneath. He was polite and tidy, he only looked briefly into each box. Once the customs check was signed off we were waved through to the final barrier, passports checked and we entered Turkmenistan. 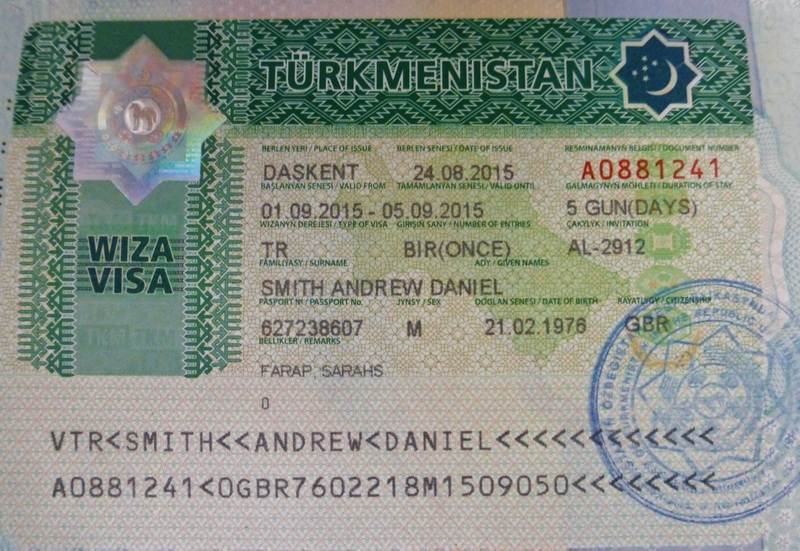 Although Turkmenistan wins the most amount of stamps and paperwork, it was fairly organised and we were directed to where we needed to go next, officers were friendly and helpful and although you pay a lot it was all official with receipts issued. The entire border crossing took about 3.5 hours but was relatively stress-free and straightforward.